Syfy has announced that Dark Matter will be returning for a second season of 13 episodes in 2016. Fellow freshman series Killjoys was also renewed for another season today. Executive producers are Jay Firestone, Joseph Mallozzi, Paul Mullie and Vanessa Piazza. Founded in 2006, Prodigy Pictures leads the way in the production of quality film, television and cross-platform media. Prodigy is responsible for the critically acclaimed television series Lost Girl, airing it’s fifth and final season on SyFy in the U.S. and on Showcase in Canada. Prodigy Pictures’ mission is to utilize the best talent worldwide to produce the highest quality content for a range of media. To that end, Prodigy has developed successful, international partnerships around the world, including those in the UK, France and the United States. Kind of glad. Not really a fan of Soap Operaesque TV shows, but I did like this one because in some ways it reminded me of how Star Trek Voyager was. There they were, strangers thrown into a world that they knew nothing about, and they learned how to cope with each other’s slight oddities, trying to use them to help the group survive. I found Dark Matter reruns. First time i’d ever heard of it. Watched all the episodes over three days. Was only sorry that i used them all up so fast. Waiting for 2nd season. This is a very good show and I hope it stays longer than 3 seasons and also Kiljoys is another very good show. I miss Lost Girl and will miss Bitten after this season. Dark Matter has been the best show on SyFy since the second season of Continuum in my book. It’s refreshing to see space opera that isn’t joyless and inhuman, where characters act like people instead of cardboard cutouts or tired clichés. This is the spiritual child of shows like Firefly and Babylon 5… always need more of those. Good move, guys. I lean a little toward ‘Killjoys’, but both shows are quite enjoyable. 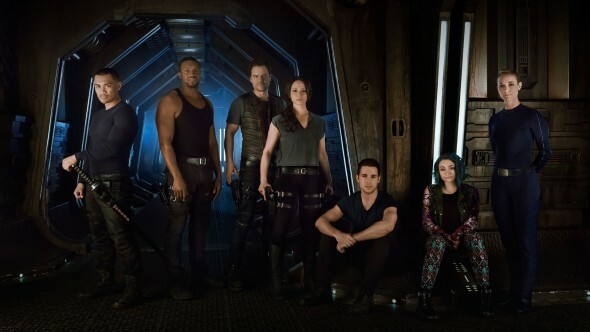 I watched every episode of both Dark Matter and Killjoys on Syfy and since this past year they were the only programs that I watched on Friday night, I was hoping they would be back. They are actually are enjoyable, and while there is some violence, it is not overwhelming. They have actually had some character development on these shows to get something like a 3D look at the characters. They might not make it on the networks, but the MSM doesn’t have many shows worth watching in the Summer. Well it’s about damn time I’m so glad they picked it up for season 2 can’t wait for the Dark Matter/Killjoys Cross-over episode it’s gonna be awesome! I love Dark Matter…they are in the same “universe”?